A new book Oil Strike North Sea will be published on the 7th September. 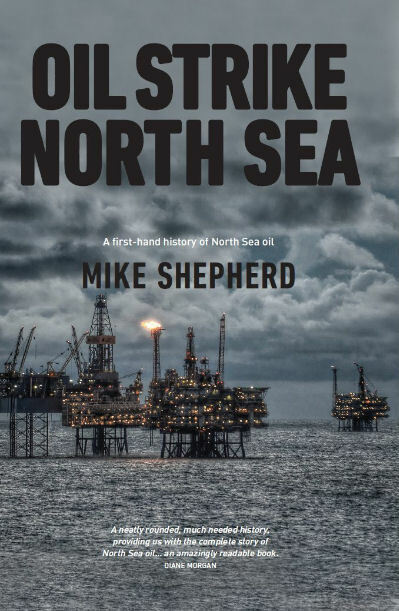 It is an overview and history of the search for oil and gas in the North Sea, something author Mike Shepherd has been actively involved with since 1980 and several of his own experiences are described in the book. Mike shares with Voice readers how the book came about, and his belief that Aberdeen Was Short-Changed Over North Sea Oil. I had cooperated with Diane Morgan on her recent book, Aberdeen’s Union Terrace Gardens. Diane asked me to contribute one of the chapters in the book detailing the economic background to the abortive city garden project. Working so closely with a professional author such as Diane had inspired me to write my own book and the North Sea oil industry was an obvious topic, particularly as not many non-technical books have been written on it. Diane very graciously provided an introduction to my book and seems to have enjoyed reading it going by her comments. I want to concentrate here on one small aspect and this is part of the chapter dealing with Aberdeen. Although I’m Aberdonian born and have lived in the city for most of my life, the details of my research for this section astonished me when I realised its significance – it became clear that the Aberdeen area has been massively short-changed by both national governments over the last 40 years. Let’s summarise the case: The tax take from North Sea oil and gas is now more than £300 billion. The amount provided by both the UK and Scottish national governments to support onshore North Sea oil infrastructure in the Aberdeen area – almost nothing. So who paid for the onshore infrastructure then? We did. Check that, over £100 million per year. It’s ironic that several other regions in the UK have directly benefitted from North Sea oil revenues but not Aberdeen. The Shetland Isles, having gained revenue from the Sullom Voe oil terminal, have accrued an oil fund of over £400 million in two separate trusts; the Orkneys likewise have an oil fund of about £200 million. Elsewhere, as a consequence of the agreement on licence boundaries in 1966, Northern Ireland gets 2.5 per cent of oil and gas royalties and until 1991, the Isle of Man received 0.1 per cent. Yet, an initiative by Grampian Regional Council to apply rates to offshore oil platforms was stopped by the UK government. How did this situation happen? Here is the explanation given in my book. When the North Sea started up in the 1970s, the Labour Party in government were keen to try and get as much of the industry as possible relocated to the Glasgow area. There was an under-employed workforce in Glasgow that could easily adapt to the engineering skills required for North Sea oil, whereas the Northeast of Scotland was deemed likely to be overwhelmed both environmentally and socially by the oil industry. They didn’t want the oil industry here. Despite for instance, the establishment of the new British National Oil Company headquarters in Glasgow, the oil companies in any case decided to move to Aberdeen. Maggie Thatcher’s Conservative Party took over government in 1979. It wasn’t their policy to give regional funding to support private enterprise even if the case was well-deserved; the Aberdeen area was considered remote and politically irrelevant for their purposes. A large proportion of the oil revenues was used to support a reduction in the top rate of income tax which in turn fuelled house price rises in England. When the Scottish government turned up in the 90s, nothing much changed. The political central of gravity in Scotland is the Central Belt and Aberdeen is almost as remote to Holyrood as it is to Westminster. Witness the case of the funding for the Aberdeen bypass by the Scottish government. In an extraordinary decision, both Aberdeen City and Aberdeenshire Council are each expected to fund 9.5 per cent of the costs, something neither council can afford given their debts. Where does this leave Aberdeen? What happens once the oil industry leaves the area? Despite all the guff about city centre regeneration, Aberdeen’s big problem is its transport links with the rest of the country and its industrial base outside of North Sea oil activities. Aberdeen is just as remote now as it was before the oil industry came. The UK’s motorway network stops at Perth and the roads north of Aberdeen are a joke; they have not received the investment they deserve. Even the railway between Aberdeen and Dundee is single track for a short section south of Montrose and this leads to a major rail bottleneck. There has been a lot of jaw-jaw about improving this section but it has never happened. North Sea oil will leave a legacy to Aberdeen. While it has lasted, much of Aberdeen’s native industry has gone. One paper mill remains, the Crombie cloth mills have shut and Aberdeen’s two shipbuilding yards are no more. Aberdeen also used to hold one of the UK’s largest fishing fleets. Over the years Aberdeen has become largely a one-horse town and that horse is the energy industry. A fairly obvious move would have been for the Scottish government to have promoted the area for renewables, but this hasn’t happened to any major extent. I see this as a major shortcoming, as there is an obvious crossover between the engineering skills of the oil and gas industry and renewables. What is Aberdeen’s future? It should primarily be as a center for renewables but this would require a change in policy from the Scottish government in order to preferentially commit resources here. Some in our local business community see tourism as a growth area for the city even though a unique selling point for the city, it’s distinctive architecture and building stone, is being increasingly blighted by soul-less modern developments. What is clear and has been clear for almost a decade is that there is a concerted need for a discussion on the future of Aberdeen. This should focus on funding, regional transport links and to promote a future Aberdeen as a centre for Scotland’s renewable energy industry. The book launch for ‘Oil Strike North Sea’ is at Waterstones book shop in Union Street, 7pm on Wednesday 9th September. Cuckoos In The Nest: Latest In Aberdeen Gardens War. When did Scotland base it’s entire economy on oil? I think you will find that was only the media who was saying that. There are a lot more that Scotland has to offer than oil, but the point Les was getting at was if we were ruling ourselves, we could have set up the oil fund in the first place. The price of oil will go back up once the Saudi’s and Americans have stopped pricking around with the prices and Russia. The Shetlands, Orkney and Isle of Man can all negotiate better terms because they are the only ports/land mass around that area. If Aberdeen had tried to do the same, the Oil industry would have likely gone somewhere else (Dundee, Peterhead, Cromarty), not a great comparison. Your absolutely spot on with your last part Rah, too many friends and family are losing their jobs and who is doing anything about it. Firstly yes I am pro-independence but that’s not the point, the point is as highlighted again the North sea has generated over £300 Bn for the UK Government, now the industry and Aberdeen has managed to sustain it’s self due to the oil, but now we need help and we don’t have the oil to help the city or jobs the UK Government have left us high and dry. I know Scotland would need to borrow to make up the short fall, but hey guess what so do the UK currently, the main focus should be on the future. The Scottish Government are doing all they can currently to help the situation only the UK can put more money in or even better change the Taxation in the short term for the oil companies. The main thing for me all of this highlights is regardless of which government the oil money has been quandered, with nothing saved for situations like this. If this was our personal finances we would only have our self to blame, so why should the UK Government be any different. I am more convinced than ever that Scotland future and the future of our resources would be far better in the hands of Scotland and the people of Scotland. There are no Broad Shoulders to be had. Scotland is Central Belt Centric and always will be as that is where the majority of voters live. As a consequence Aberdeen has frequently received a much smaller share of the Block Grant than many other authorities. The exception is the SNP dominated Dundee City Council where vast sums are being spent on large infrastructure projects. However the above situation has, in my view been compounded by the tribal politics within Aberdeen Council and disastrous planning decisions, aka Union Square Development which has almost paralysed Harbour traffic and revenues. Look to the growth of Montrose and Peterhead Harbours for comparison. We must also realise the current oil price is driven partly by global politics and ageing, inefficient North Production facilities. So let’s stop whinging about what might of been and get behind lowering production costs, or stay we are and lose everything. Readers will know that the Scottish Parliament did not reconvene until 1997, at which time the ruling Labour/Liberal coalition was not styled as the Scottish Government but the Scottish Executive. After victory in 2007 the SNP ruling minority renamed themselves the Scottish Government but this name was not recognised in law until 2012. There’s nothing like attending Offshore Europe to remind yourself that the oil sector is a world apart, the direct bus service put on for it between the airport and the AECC isn’t just for convenience. Like the industry itself Aberdeen isn’t a home, it’s not even a genuine long term investment, it’s just a place they have to pass through on their way to and from the business of extracting oil and servicing the extractors. From the well-paid rig-worker to the well paid executive set, why invest or even care about a city which you’re likely not from and won’t be staying once your reasons for being there are gone? Even Aberdonian Oil Workers show a lamentable disinterest in the long term viability of their home city. The city center is grungy and neglected, and while there seems an increase in construction projects lately, they all seem poorly thought out. Stewie Milne’s cheap little boxes built en masse on greenbelt land for not cheap prices, bland office blocks, more unwanted shops and office space going where the old council offices were, replacing an eyesore with…an eyesore. It’s kinda sad that the council which greenlights these projects found the money to set up in Marischall College while the city around it rots but for the developments that the oil sector wants. All that oil wealth passes through the city but it seems none of it actually sticks around for the benefit of the burghers. Oil was never the ‘be all or end all’ for an Independent Scotland may I firstly say folks-we can and could always do better as an Independent Country and I still believe that firmly. Great read,and very informative..the only thing I would disagree with within which I have read is within this article is the comparison between Westminster and the Scottish parliament..how on earth could they control Westminster plans without Full control over,in this case-oil? As Stan describes above,it is exactly the same in most towns and cities within Scotland and it’s heartbreaking to know that we could have put an end to Scotland constantly being short changed via Independence. We will Always be in this situ folks..unless We as a nation change that once and for all..have many friends in Aberdeen,lived in the central belt.the east neuk of Fife and back(currently in North Lanarkshire where you wouldn’t believe the hardship amongst folk)..next time maybe? Certainly hope so..
Having returned to Aberdeen after living abroad I was shocked and saddened to see what the City Centre and Union street has become. 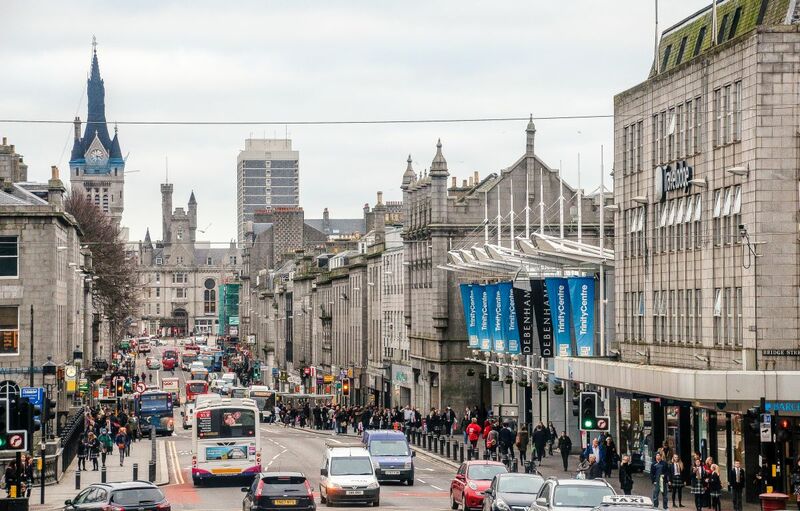 We can have no faith in the years of Aberdeen City councillors that have allowed this to happen, do they ever walk or drive down Union Street? As for the sporting facilities provided for the children of Aberdeen both the Council and the many people who have made millions out of Aberdeen should be ashamed, in Spain where I lived every small village has asto turf football pitches and tennis courts which are the heart of their communities, these facilities are provided by cash strapped councils who prioritise their youth and communities. For a city like Aberdeen there is no investment in our youth by providing decent facilities for children to enjoy sport or to promote a sense of community which is sadly lacking in Aberdeen. Aberdeen is a centre of excellence with our oil industry knowledge but why does it feel like a back water city that nobody cares about. Give us a council that wants to work with the like of Sir Ian Wood who wants to give Aberdeen something back.